It’s now that part of the year in which Davy and I remind ourselves that we “just need to get through to Thanksgiving.” Which we have, almost. Lots of traveling and worrying about the weather have happened, including worrying about friends in really bad weather. Now, we are looking forward to doing stuff on projects that were put aside for a bit. This includes a small project of mine with a real deadline – I need to make a tour arrangement of one of the movements of my Mass. The UMaine University Singers are taking the Sanctus on tour next spring (they just premiered the Kyrie last weekend), and while they will use the original instrumentation on campus (2 clarinets, bass clarinet and piano, with me on bass clarinet), the clarinet trio won’t be able to go away with them for a week in March on their way to NYC. So, what to do to replace the clarinets? What do we have around the house? Actually, we only had three of these when the idea crossed my mind – this after attempting to write a 4-hand arrangement of the Sanctus and realizing that this would not work, ever. When I asked to try one of Davy’s melodicas that he’d bought for various pieces of his (just google them, really), he was very enthusiastic about the idea, but insisted that I needed “my own” instruments for my work. Hence, my Christmas presents have arrived early. 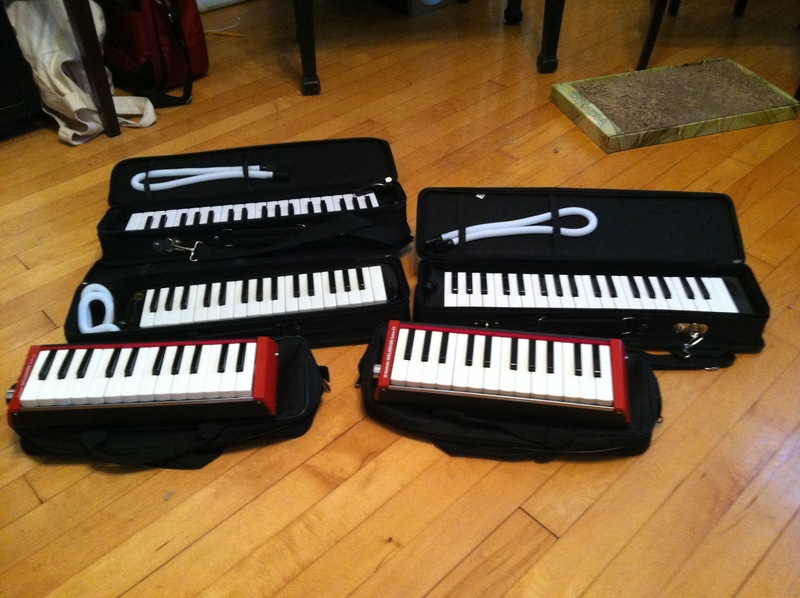 And after Thanksgiving, I get to demo the melodica and bass melodica (yes, both…why wouldn’t you have both?) for the students that will be playing these things on tour alongside Laura Artesani on the piano. I foresee much amusement, but also some nice sustained chords.